4.3 out of 5 based on 254 user ratings. Mesclun is a mixed salad recipe from Provence in France. Organik Dalat prepares its Organic Mesclun with young lettuce varieties that are grown organically following the organic s of Europe (Organic Farming) and the US (USDA) and processing if following international HACCP s. Organik Mesclun is a combination of 9 vegetables: organic frisee fine, radicchio, lollo green, lollo rossa, oakleaf yellow, oakleaf red, oakleaf green , batavia and romaine lettuce. It is already triple washed. 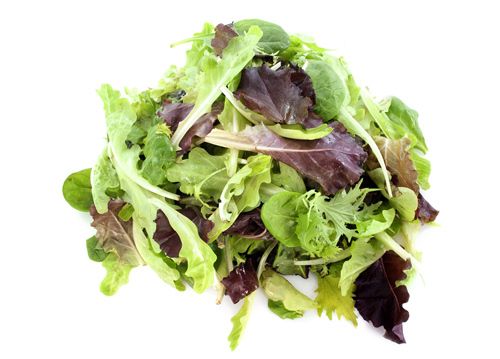 - Mesclun is rich in fiber and low in calories. - Mesclun is also rich in vitamins A, C, iron, calcium, potassium. - Due to its high levels of fiber, it supports those who are on diet and those who want to increase their intake of vegetables for daily meals. - Its high levels of vitamin A is good for the eyes; vitamin C helps strengthen the immune system, acts as antioxidants and helps prevent cell damage. - Eat as is or put a dressing of your choice. - Add your favorite nuts, seeds, meats, fruits or dried fruits (walnuts, almonds, pumpkin seeds, cheese, ham, bacon, raisins, blueberries, cranberries) and your favorite dressing and it becomes a meal by itself. - Add in sandwiches - Place the cheese, meat and eggs on a slice of sandwich or pita then top with organic mesclun. Let's enjoy the delicious and nutrient sandwich.